1. Windows.edb is the index file that Windows Search creates on most modern Windows systems as long as the indexing service is turned on (as mine was, obviously). 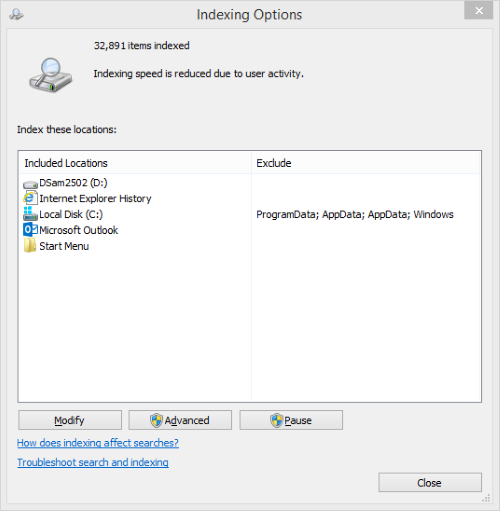 Visit the Indexing Options in Control Panel to get at its settings and location. 2. Some number of users have reported mushrooming or ballooning sizes on this file, particularly in Windows 8 (8 and 8.1) versions. Some of these online postings talk about corrupt indexes growing incontrollably large; I suspect it has more to do with how much stuff you want to index. 3. There are any number of ways to nip this monster at the roots, including turning off the indexing service (which does away with it completely), reducing the maximum amount of disk space the service is allowed to consume (it seems to run in 5% increments, assuming you leave it on the boot/system drive, otherwise it gets free rein over the entire disk), rebuilding the index, or moving the index file to another drive. Because I like to search my huge trove of email messages in Outlook (1.2 GB of active messages, 10.6 GB of archived ones), I feel compelled to leave the Indexing Service turned on when it comes to my production PC. First thing, I tried re-indexing, but it didn’t seem to make any difference on my machine, even after a quick reboot. But with 1.5 TB of other SSD storage on that machine, I could — and did — easily move the index files to another fast disk without giving up on performance. So that’s the option I ultimately took, relocating it to my F: drive (which is a 256 GB OCZ Vertex 4. and no slouch as disk speed, though not as fast or vast as my 500 GB Samsung 840 EVO system/boot disk). The upshot of this activity, including the reindexing of my included storage, is a Windows.edb file that is now a mere 517 MB in size. That’s a whole lot better than the 37-plus GB it occupied on the system/boot disk before I transferred it to a different disk.